A 12-year-old girl’s life and love are shattered by the war in Bosnia and Herzegovina - The Moth's Collective's stunning entry into the New York Times' 'Modern Love' series. Maybe it’s because it’s the summer, or maybe there’s something in the air – but love and romance seem to be hot topics on Short of the Week at the moment. Following hot on the heels of recent features Offline Dating, My Daughter’s Boyfriend and THE TRUTH ABOUT MEETING WOMEN, comes A Kiss, Deferred – a short animation from the Moth Collective about childhood sweethearts separated by a Civil War. 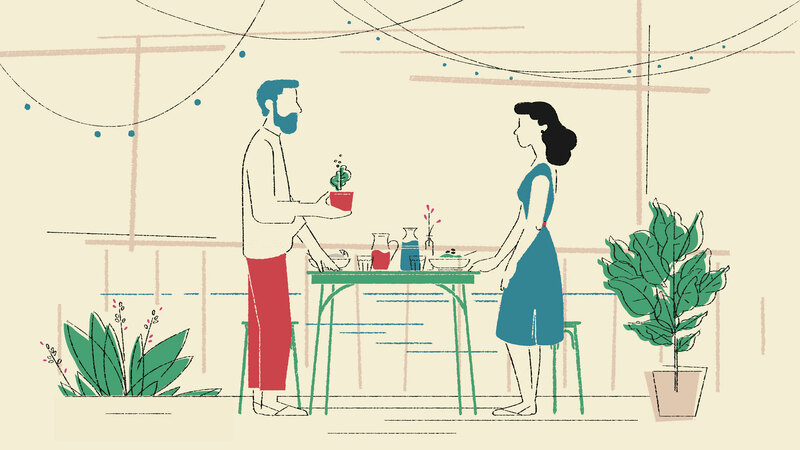 The latest animation to be created for The New York Times’ Modern Love series – a collection of weekly reader-submitted essays that explore the joys and tribulations of love – the Moth Collective’s entry is based on a moving and immersive article by Nikolina Kulidžan. Fans of the project, after being impressed by the animations of Joe Donaldson, Freddy Arenas and Jimmy Simpson, the Moth team reached out to the producer of the series who gave them the opportunity to create a short for one of July’s articles. As you would expect from a Moth Collective piece, the aesthetic of A Kiss, Deferred is as beautiful as the story it accompanies, managing to feel both minimalist and intricately designed in equal measures. Eager to find out how much of the style was influenced by Kulidžan’s narrative, I spoke to the lovely Marie-Margaux Tsakiri-Scanatovits to discover how the team came up with the film’s distinct style. “As soon as we got the V.O. and heard it was a story based in Yugoslavia in the 90s, we started doing research on imagery from that era and collecting reference material”, says Margaux. “From that we made a colour palette based on some poster art that felt quite Balkan. We wanted the style to be minimal yet sensitive, so we chose a graphic approach for the backgrounds and a gentler one for the characters, something that is also reflected in the animation technique. Nikolina’s story is a classic teenage love story that most of us can relate to. The school environment is something powerful at that age, so we wanted to incorporate it as the framework for their romance. After reading the full written interview when it was posted up, it was fun to see the details that we had guessed at and turned out to be true : Marco was apparently a skateboarder, and without knowing we placed a skateboard in their rooms in one of their shots. Also that their eventual kiss took place in a restaurant by a river!”. For those of you unfamiliar with Moth’s Collective’s work, the group is made up of a trio of Royal College of Art graduates in David Prosser, Marie-Margaux Tsakiri-Scanatovits and Daniel Chester, who decided to continue working together after their studies when they noticed they shared the “same interests within the [animation] field”. Not content with the abundance of talent already in their triad, the Moth Team decided that with such a tight deadline for this project they would enlist the help of their talented friends for this latest animation. Bringing in previously Short of the Week featured filmmakers Eamonn O’ Neill and Joe Bichard to help with the film, along with Marcus Armitage, Jonathan Djob Nkondo, Noriko Ishibe and Claudio Salas, the collective was able to form somewhat of an animation “dream team” for this project. “We are lucky to be friends with such talented people and be able to bring them all under one ‘roof’ for projects like this one”, admits Margaux, “as you work with people and you get to know their individual strengths, you gain a vision on which scene to allocate to which person and can predict what they will bring into it. Given the short schedule, we had to concentrate on the design and the direction, so we left the animation in the able hands of all that wonderful team, and let them do their magic!”. When not creating stunning animations for important causes like the Global Canopy Programme, HIAS and the NSPCC, the Moth team can be found working on their Late Night Work Club film (the new trailer for which has just been launched) and animating for a couple of feature films. A new Moth Collective animation is always a pleasure to watch (and a pleasure to write about) so lets hope we’ll be seeing a lot more of their work on Short of the Week in the coming years.